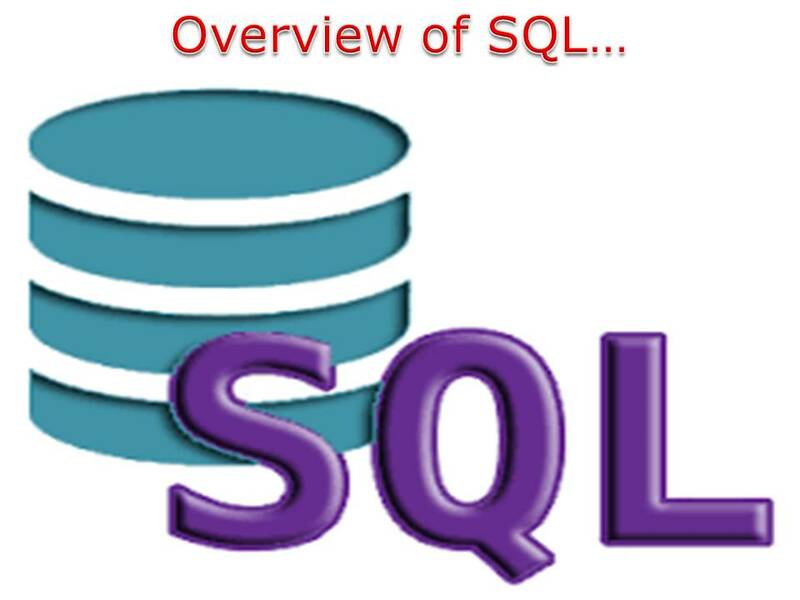 SQL (Structured Query Language) is a standard language for accessing databases. All Relational Database Management Systems like MS Access, MS SQL Server, Oracle, Sybase, MySQL, DB2 use SQL as standard database language. We can practice SQL Commands in any Database Management System, Install any Database Engine like Oracle, SQL Server, Sybase, MySQL etc… and practice. • A database contains one or more tables. Each table is identified by a name, Tables contain records (rows) with data. • Most of the actions we need to perform on a database are done with SQL statements. • All the SQL statements start with any of the keywords like SELECT, INSERT, UPDATE, DELETE etc…and all the statements end with a semicolon (;), semicolon is the standard way to separate SQL Statements. • A data type defines what kind of value a column can contain, we have to use data types while creating database tables, choose a particular data type for a table column based on our requirement. Operators are used to perform Arithmetic, Comparison and Logical Operations. The Data Definition Language (DDL) is used to create and destroy databases and database objects. The Data Manipulation Language (DML) is used to insert, retrieve and modify database information. • Modify information contained within a Table. • Delete information contained within a Table. The Data Control Language (DCL) allows database administrators to configure security access to relational databases. The SQL Joins clause is used to combine records from two or more tables in a database. Oracle database is a relational database management system (RDBMS) developed by Oracle Corporation. i) Enterprise Edition: Offers all features, including superior performance and security. ii) Standard Edition: Contains base functionality for users. ii) Enterprise: SQL Server Enterprise Edition includes both the core database engine and add-on services. iii) Standard: SQL Server Standard edition includes the core database engine, along with the stand-alone services. v) Workgroup: SQL Server Workgroup Edition includes the core database functionality only. MySQL is an Open Source Relational SQL database management system used for developing web-based software applications. i) Standard Edition: Standard Edition enables us to deliver high-performance and scalable Online Transaction Processing (OLTP) applications. ii) Enterprise Edition: Enterprise Edition includes the most comprehensive set of advanced features and management tools. iii) Cluster Carrier Grade Edition: Cluster enables users to meet the database challenges of next generation web, cloud, and communications services with uncompromising scalability, uptime and agility. PostgreSQL is a powerful, open source database management system. It runs on all major operating systems, including Linux, UNIX, Mac OS X, Solaris, and MS Windows. Microsoft Access is bundled as part of the Microsoft Office suite. It is only available on the PC version. It is a desktop database system because its functions are intended to be run from a single computer.